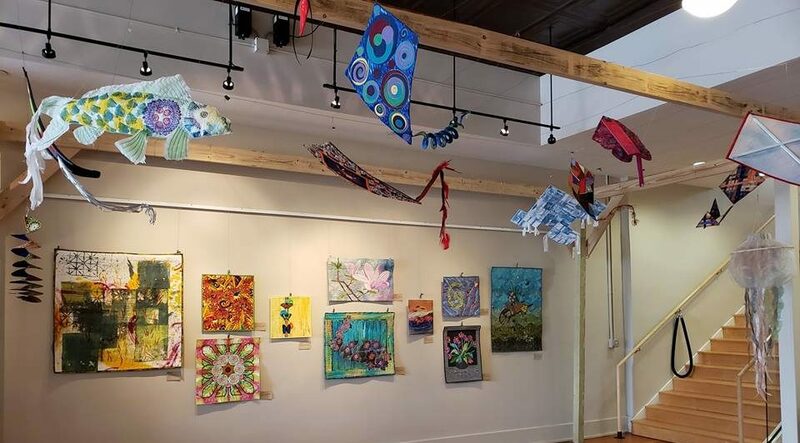 The same talented group of quilters that created the exhibit currently on display at the Iowa Quilt Museum has another exhibit on display at the Warren Cultural Center in Greenfield. This homage to our latest season titled Springtime & Kites will be on display through the end of March. 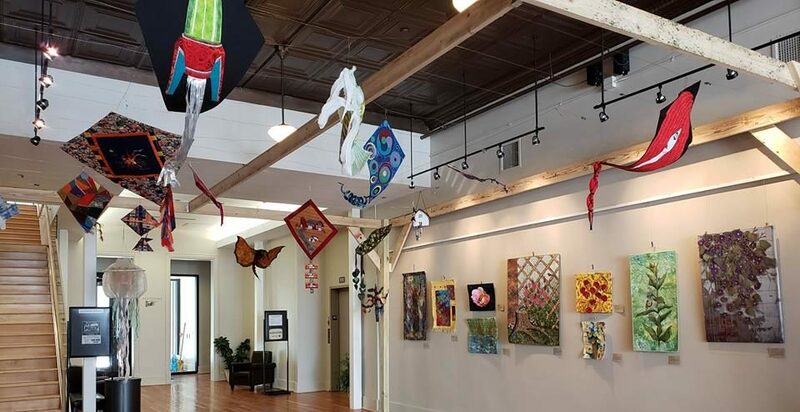 The lobby gallery at the Warren Cultural Center is open to the public Monday-Friday 9:00 am – 5:00pm and Saturdays 10:00 am – 3:00 pm with no admission charge. 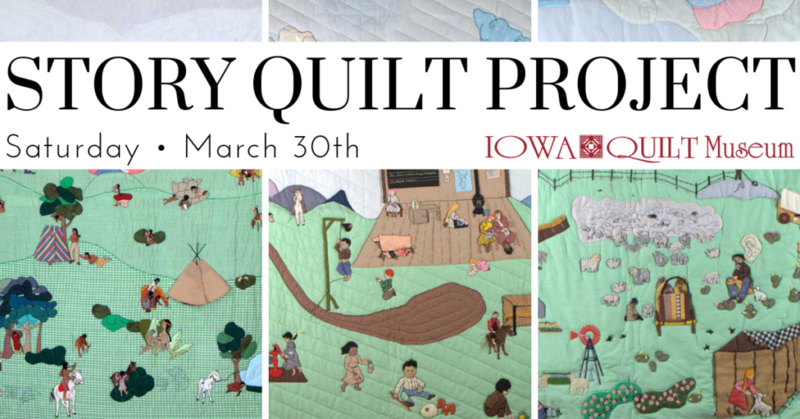 Jean Wakely will take up residence at the Iowa Quilt Museum on Saturday, March 30th, to share three quilts from the collection of Jewell Wolk and their stories. From 1980 to her death in 2011, Jewell Wolk created nine story quilts covering a variety of topics. For many of the quilts, she spent years researching the stories conducting interviews with dozens of people who lived the stories shown on the quilts and researching in libraries, museums and related information sources. Once Jean completed her research for a particular quilt, she drew the scenes and then subdivided them into small segments. This allowed her to position things like arms, legs and heads in active poses. She also created a new appliqué process which she called “appli-j” This sewing process results in a black border around all of the individual segments. In this way, each stands out from its border elements and creates a visual excitement that is not found in the standard approach. Jean will have three of Jewell’s story quilts, ‘The Purple Sandwich Quilt,’ ‘Women of the Plains,’ and ’23rd Psalm’ on display from 10:00 am to 4:00 pm and will be available to visit with guests. At 11:00 am and 2:00 pm, she will share her story telling presentations. This special program is included with regular admission to the Iowa Quilt Museum, $6 for adults, $4 for children. We welcome young audiences for this program! 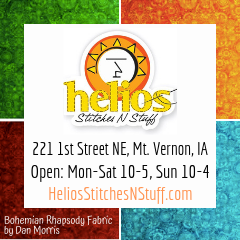 Here’s one last chance to come sew with us this spring! We’ll gather on Monday, April 8th from 9:00 to 3:00 to be inspired by the quilts around us and our friends as we sew the day away. Reserve your spot for just $20 at THIS LINK. 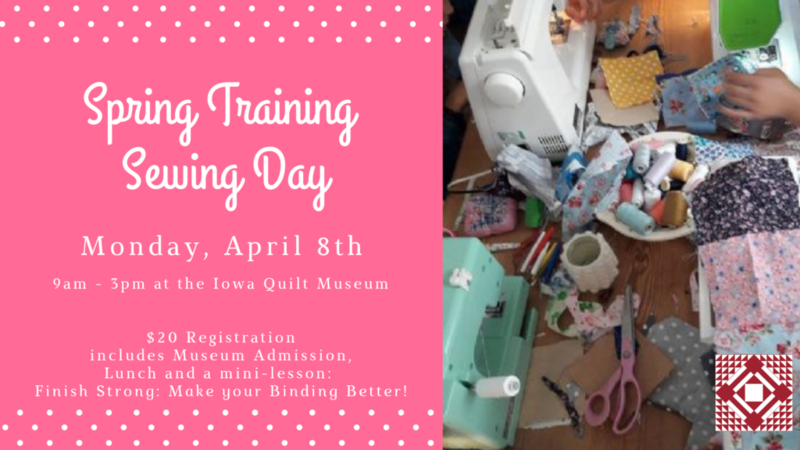 Your fee covers museum admission, lunch, a mini lesson with master quilter Jill Mead titled, Finish Strong: Make your Binding Better, and supports the work of the Iowa Quilt Museum. Join the team at the IQM! 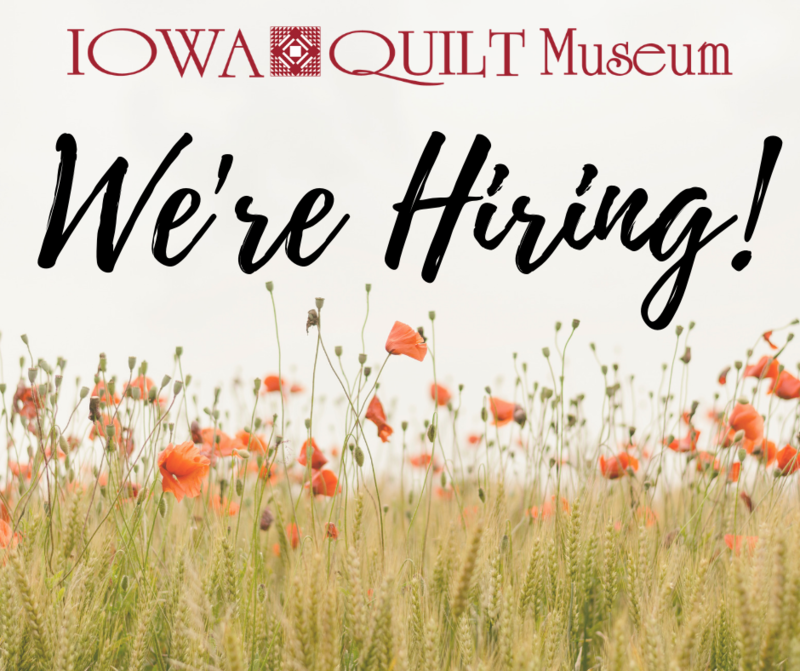 The Iowa Quilt Museum is looking for friendly faces to greet visitors and attend to our gift shop. The position could be filled by one person or multiple persons. Pay will be $8.00 – $8.50 per hour depending on experience. 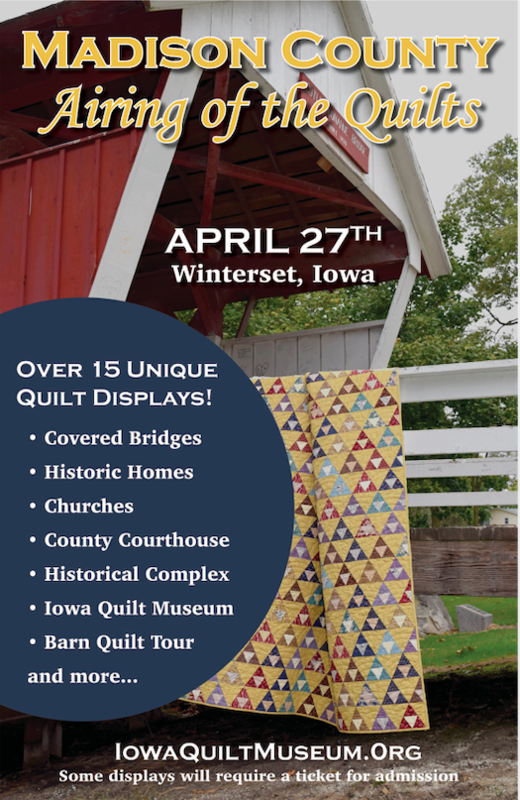 We are looking for 10 to 12 log cabin quilts to display in the Winterset City Park during the Airing of the Quilts. 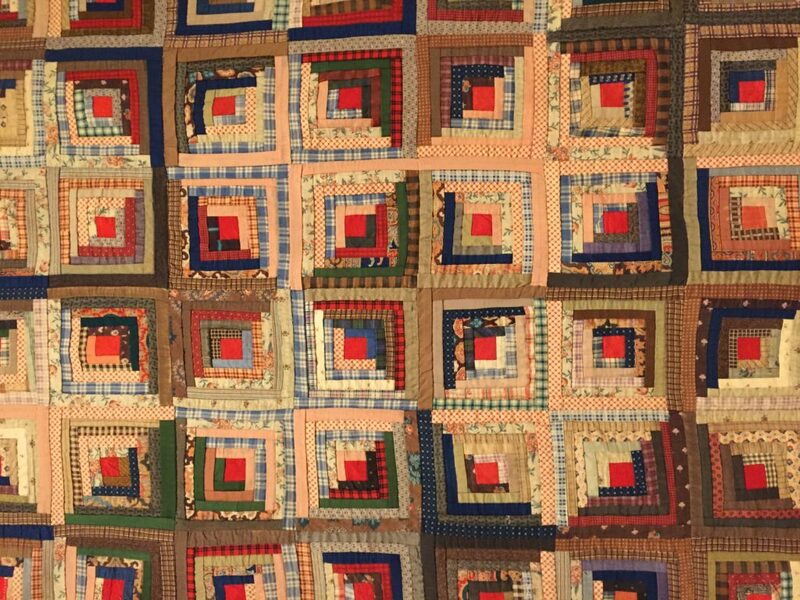 If you have a log cabin quilt, either vintage or new, that you would like to submit, please email a photo to director@iowaquiltmuseum.org. The quilts will hang outdoors in an arbor shelter if the weather cooperates, or an open-air but roofed shelter if there is precipitation. They will need to have hanging sleeves attached. Museum Director Megan Barrett: director@iowaquiltmuseum.org. 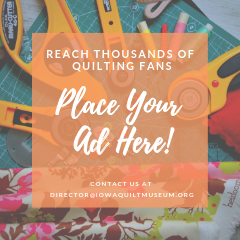 If you’re reading this but it didn’t come to your inbox, use the Email Signup form on the top of this page to make sure you’re on the list and don’t miss out on any Iowa QuiltScape news!